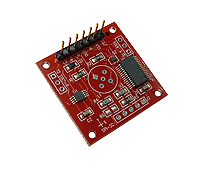 The 1-6200-005 SPI signal conditioner is configured as an SPI slave and can be used with any Fredericks electrolytic tilt sensor. A single signal conditioner can be connected to one dual axis sensor or up to two single axis sensors, providing output from 0% to 100% of the sensor’s range. Fredericks dual-axis TrueTILT sensors can also be mounted directly on the board. Temperature sensors are included on all of our signal conditioners. Sensor and signal conditioner combinations can be mounted in a housing with potting to provide up to IP67 environmental protection. See the Inclinometers section for more details. 6200 series signal conditioners – The 1-6200-005 is part of this series of signal conditioners which can be configured with any Fredericks electrolytic tilt sensor. 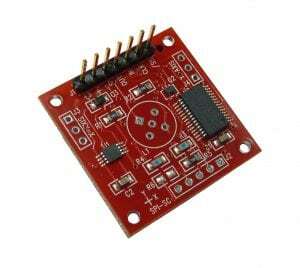 Other output options include analog, PWM, RS-232, and RS-485. The electrolytic tilt sensor and signal conditioner are provided separately or as an assembly with the sensor already installed. 0729 series inclinometers – These inclinometers utilize Fredericks TrueTilt™ wide range electrolytic tilt sensors and signal conditioners. They have a variety of outputs including analog, RS-232, and RS-485. These inclinometers have low profiles and robust plastic housings with epoxy potting to provide excellent durability and environmental protection.